How to Reach: One can reach Bondla sanctuary by hiring a private vehicle from Ponda or Sanguem as it is well connected by a wide network of roads. Spread over an area of around 8 square kilometers, the Bondla wildlife sanctuary is the smallest wildlife sanctuary in Goa. The landscape of the Bondla wildlife sanctuary is strikingly beautiful and the lush green vegetation provides a natural ecosystem. 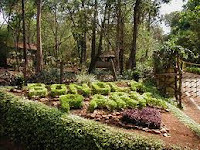 The Bondla national park has a Botanical Garden, Rose Garden and Deer Park within its premises. One can also opt for a jeep safari inside the deer park in the Bondla sanctuary. This sanctuary is a favorite among school children who come here for educational excursions. Hire a vehicle from either Ponda or Sanguem to reach here. There is a Nature Education Center over here that shows wildlife videos to tourists in order to provide vital information and knowledge about the wildlife. The Bondla sanctuary remains closed on Thursdays. The forest cover of Bondla wildlife sanctuary consists of moist deciduous forests and evergreen vegetation patches. One can find bamboo plantations along with trees like Terninalia Crenulata also known as Matti, Rosewood, Lagerstroemia, Kindall, Jamba, Mimusops, etc. The Bondla wildlife sanctuary has numerous species of animals. A zoo was established here some years back that used to provide shelter to injured wild animals or abused animals like snakes, bears, etc. The wild animals that are housed here include Panthers, Jungle Cats, Leopard Cats, various species of Deer (Sambar Deer, Spotted Deer, Hog Deer, Barking Deer and Mouse Deer), Wild Boar, Crocodiles, Snakes and Malabar Giant Squirrels. One can also view numerous bird species like woodpeckers, kingfishers, hornbills, etc.